World wide governments are starting to realize that Oil prices will continue to clime. This will affect our lives here in the States as gasoline and heating fuel prices rise through the roof. 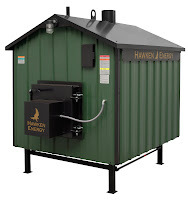 Having an outdoor wood furnace now will help lower oil consumption and protect you against the rising costs of heating. Submitted by Mikael Höök on Tue, 2010-11-16 18:54. The availability of oil worldwide has already peaked, the European Union's energy chief Guenther Oettinger said on Wednesday. "My fear is that the global consumption of oil is going to increase, but European oil consumption has already reached its peak. The amount of oil available globally, I think, has already peaked," Oettinger told a news briefing in Brussels. He was presenting a new EU energy strategy for investing 1 trillion euros over the next decade in a common EU energy network, to curb the bloc's dependence on fossil fuel imports. Submitted by Mikael Höök on Sat, 2010-10-16 10:28. On 13 October 2010, the New Zealand Parliament released a research report entitled "The next oil shock?" dealing with peak oil and future supply for the world. Some key aspects of this paper concluded that "Low-cost reserves of oil are being rapidly exhausted, forcing oil companies to turn to more expensive sources of oil. This replacement of low-cost sources of oil with higher-costs sources is driving the price of oil higher" and that "there is a risk that the world economy may be at the start of a cycle of supply crunches leading to price spikes and recessions, followed by recoveries leading to supply crunches". Schlumberger: "World will need higher prices, more investment to meet oil demand"
Submitted by Mikael Höök on Sat, 2010-09-18 13:38. Speaking at the Barclays Capital conference in New York Andrew Gould, chief executive of oilfield services giant Schlumberger said that if the world is to have any chance of meeting aggressive demand growth for energy in the years to come it will require massive investment by oil companies and a need for ever more advanced technology. Much more is needed, Gould said. He cited as a warning the International Energy Agency’s forecast for global energy demand to grow 40% by 2030, with coal, oil and gas expected to supply 80% of energy needs. To find and develop the resources to supply that demand will require investment of $350 billion a year for the next 20 years.